This was an outstanding weekend for Connecticut high school track and field fans. 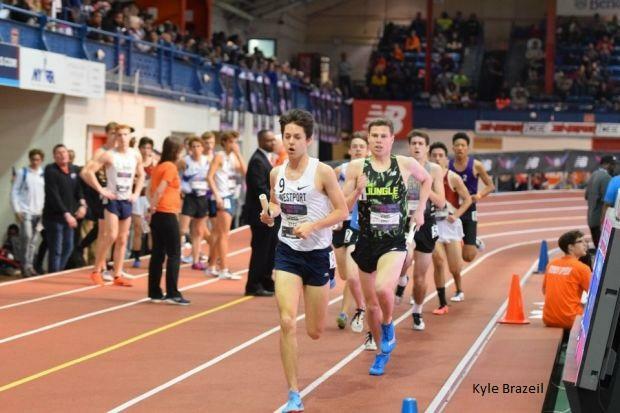 New Balance Indoor Nationals took place at the 168th St. Armory Track and Field Center in Manhattan. Local athletes took home two national titles, ten All American honors, broke two state records and countless school and conference records. There is no way we could list every outstanding performance, but here are some of the highlights. Dyshon Vaughn of Career Magnet was crowned national champion in the long jump with a new state record 24'5.50 on his final attempt. Runner up Jeremiah Willis actually had an identical jump, but Vaugh earned the win with his 2nd best jump 23'7 which was four inches farther than Willis' jump. Vaugh broke Myles Bradley 13-year-old record which was 24'2.25. Danbury boys earned their 2nd national championship in school history when the sprint medley relay team made up of Malachi Lorick, Glenroy Ford, Sean-Michael Parkinson and Malcolm Going ran the fastest time in the country this season and set a new state record of 3:28.36. The old record of 3:29.40 was set by Staples in 2012 at NBIN. Going was four seconds behind when he took the baton for the 800m leg and pulled off a 1:50.52 split to overtake East Orange, NJ who took 2nd in 3:28.99. Though not a CIAC school, Cheshire Academy's Alexis Holmes took 3rd in the 200m with a time of 23.86 and 2nd in the 400m with a 53.67. Her 200m time is the fastest any CT high school girl has ever run. Danbury junior Malcolm Going came back from his championships SMR and finished 8th in the open 800m with a new school and FCIAC record of 1:52.87 which is the 12th best time in the country. Fellow FCIAC 800m runner Emily Philippides broke 2:10 for the first time by running 2:09.82 which also breaks her school and FCIAC record. Unfortunately, the senior just missed All American by .09 seconds and one place. Immaculate girls improved their school and SWC records in both the distance and sprint medley relays. The team of Taylor Mascetta, Dominique Valentine, Emma Connolly and Angela Saidman finished 11th in the longer event with a time of 12:16.51. Then Audrey Sedensky, Molly Coyle, Valentine and Connolly combined to run 4:13.77 in the emerging elite section of the SMR. Danbury girls ran the championship sprint medley and took over the state lead with a 4:11.71. Natalee Seipio, Meilee Kry, Leah Sarkisian and Lauren Moore passed the baton to a 13th place finish. In other big action, Ally Lewis of NFA took 8th in the high jump tying the state lead with a jump of 5-7. Southington's Megan Biscoglio took 10th with a jump of 12'2.5 in the emerging elite pole vault to improve on her state lead in the event. Ian Bartlett of Ludlowe improved his school record finishing 16th in the 800m with a 1:54.58 and Fairfield Prep's Drew Thompson took 10th in the 2 mile with a 9:09.96. In the newest event in the meet, Hillhouse's Manasseh Bekele, Deshaune Poole, Jada Boyd and Nyia White teamed up to take 4th in the co-ed 4 x 400m running 3:35.84. 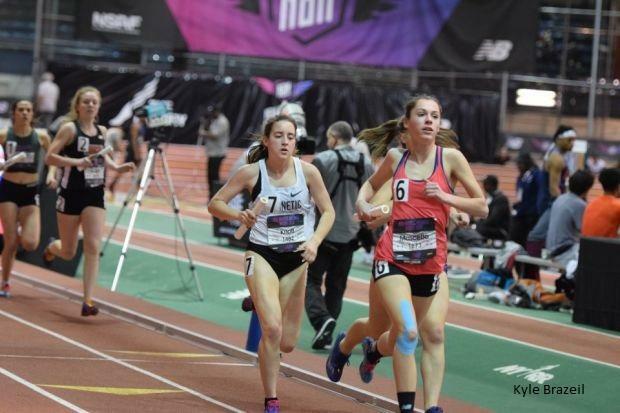 Complete results, along with video interviews and pictures of the 2018 New Balance Indoor Nationals can be found here.